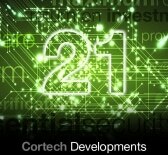 2013 represents a significant milestone for Cortech Developments, with the Company celebrating 21 years as a leading provider of specialist software solutions for integrated building, fire and security management. So what does the future hold? Cortech’s expertise has evolved and we are now able to offer convergence with back office client applications, providing useable data for monitoring, control, analysis and maintenance of smarter building performance. How will this benefit your Organisation? Put simply, greater situation awareness with business systems, building management and energy efficiency. To find out more, visit the Cortech sponsored Intelligent Buildings Theatre at IFSEC, Birmingham NEC, 13-16 May 2013. Furthermore, Cortech are planning development Investment in the latest software architecture plus web based services, mobile applications, 3D graphical display / graphical integration enhancements, reporting, workflow and extensions to our library of third party manufacturer software drivers. While the future remains exciting for the team at Cortech, it is worth reminding ourselves why DATALOG is common place amongst many UK and International high security environments and critical infrastructure. – Cortech has become one of the leading software integration companies in the building, fire and security sector. – Datalog has been deployed at sites in 26 countries. – Datalog has proven to be technologically sustainable evolving from MSDOS, Windows 95,98,XP, Server 2003, Vista, Win 7, Server 2008* and VMware. – There have been five major revisions of Datalog since 1992. – In house software development – reduced risk from outsourcing and time zone delayed response. – Organically established workforce with very low staff turnover – retained experience and expertise. – In house IT and third party technology knowledge – skills to adapt, respond and achieve excellent customer support. – ISO9001:2008 – accredited since 2008. – Manufacturer and systems installer – agnostic. – Independent organisation that can react quickly and responsibly to market requirements. – Excellent credit history, financially strong and have shown continued growth by product innovation and good customer service. – Plimsoll Analysis – In a recent report produced by Plimsoll Cortech Developments were rated as STRONG. Plimsoll is the world’s leading provider of market reports and company analysis. – Cortech commit regular R&D resources to drive innovation. – The Company Directors have overseen significant growth at Cortech Developments over recent years, culminating in a £1.2 million pound investment in new state of the art offices with demonstration facilities and the recent major release of the DATALOG 5 GUI for Windows7/Server 2008*/VMware.